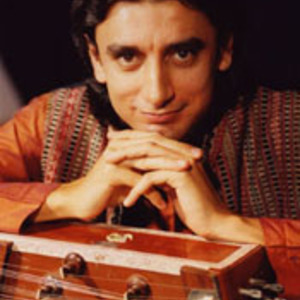 Manish Vyas is a unique phenomenon in the world of music. A talented multi ? instrumentalist and singer, in the last few years, he has emerged as an extraordinary performing and recording artist. Music is quite simply in his blood. He grew up in a family, very dedicated and passionate about Indian music and in this atmosphere was exposed to its many different forms: from classical, to ?kirtan' to folk. in the last few years, he has emerged as an extraordinary performing and recording artist. Music is quite simply in his blood. He grew up in a family, very dedicated and passionate about Indian music and in this atmosphere was exposed to its many different forms: from classical, to ?kirtan' to folk. Realizing his talent at an early age, his mother initiated him into Tabla age 9. A few years of basic initial training let him to the feet of Maestro, Ustad Allarakha in Mumbai, where his training continued for 5 years. Simultaneously, it was during this same time that Manish was exposed to a totally new genre of music: namely world and fusion music, through meeting a variety of musicians from around the world at the then world famous Osho Commune International, Pune. During this time his passion for melody led him to pick up the ?Santoor' ? a 100 string instrument and from there he moved to first singing then harmonium and keyboards. of the well known recording names in the New Age music world today, namely Deva Premal (mitendevapremal.com), Prem Joshua (premjoshua.com), Chinmaya Dunster, Shastro (malimba.com), Yashu and many more. He has appeared as session musician and composer / arranger on over 2 dozen CD's. Continuous experimentation with these musicians expanded his horizons beyond Tabla and Indian classical form but it was his dedicated involvement with them added to his undoubted talent and versatility that eventually brought him into the limelight. Now at 32, Manish is a fully-fledged performing artist, traveling around the globe throughout the year. At present he is performing with a similarly multi-talented group of musicians. ?Prem Joshua', one of the main pioneers in the world of fusion music, plays sitar, saxophone and bamboo flute. They are joined by ?Tanmayo' from London, a fusion violinist, singer and keyboard player and Hina Sarojini from Singapore an Indian Classical dancer and vocalist. The band travels to various places in Europe in spring and summer, covering mainly Germany, Holland, Austria, Italy, Switzerland, Denmark, Spain and Greece. While later in Autumn, the band will be performing at many prestigious and large venues in USA, with a tour of about 25 concerts. Sir Paul McCartney to play at his wedding in Ireland as part of the ?Celtic Ragas? band. In addition, during the USA-2002 tour with Prem Joshua, their concert in California was attended by none other than Grammy award nominee Anoushka Shankar, daughter of Sitar maestro Pt.Ravi Shankar. Thrilled with the music, she gave encouraging feedback to Manish and Joshua saying ?you make Indian music very, very accessible to people. ?